By Keith Cowing on September 11, 2015 7:13 AM. Keith's 11 Sep note: One of the ways to contact NASA procurement personnel is by fax. This is the case at all government agencies. Indeed, NASA's various field centers incude Fax numbers in procurement notices. But not NASA HQ (it would seem). Oddly, all of their fax machines seem to have the same number i.e. 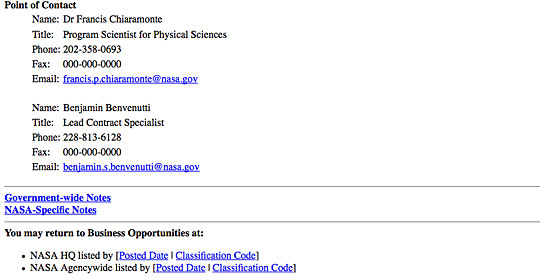 000-000-0000 as is seen on this current procurement notice Research Opportunities in Materials Science - MaterialsLab Open Science Campaigns for Experiments on the International Space Station. This notice states "Questions with regard to responding to this NRA may be addressed to the contacts referenced in the full solicitation document." So ... are they really suggesting that you send a fax (if that's how you need to communicate) to 000-000-0000? Keith's 15 Sep update: NASA's response is that they put the 000-000-0000 in so that people will call or email and not fax. Duh, why not just say that in the notice? This page contains a single entry by Keith Cowing published on September 11, 2015 7:13 AM. The Public's Opinion(s) on Space was the previous entry in this blog. Bad News From Earth is the next entry in this blog.